You will first be introduced to the many types of tofu products. You will then learn how to cook them in 6 delicious recipes and make a dessert tofu. Tofu is a staple of Japanese cuisine, eaten by millions everyday. Many types of tofu are regularly used in Japanese cooking. Tofu is not only eaten as it is but also it is fantastic to cook with because it is a super-versatile ingredient with several different firmness options. All made from the same simple ingredients: soy beans, nigari (a coagulant) and 90% of water. The most important thing to know about tofu is that it is a great source of protein, calcium and low in calories! 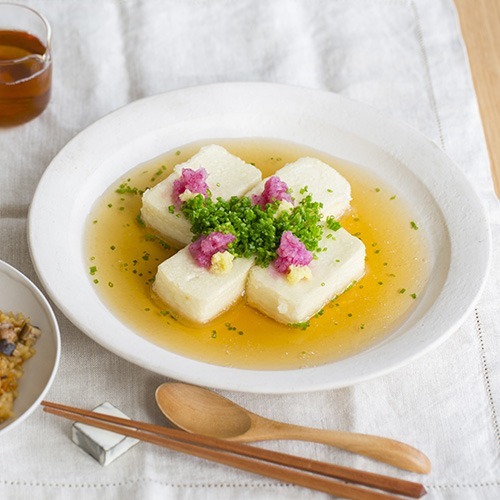 In this special class, you’ll be introduced to a range of Japanese ingredients, a variety of tofus, and learn how to cook delicious tofu recipes! We start by introducing the ingredients, follow up with the cooking session, and finally eat what we just made! We use fresh organic tofu which made by Clean Bean Tofu, and organic silky tofu from Clearspring.